Snazzy camera-filtering smartphone app Instagram has just announced version 2.0 of its app, bringing new filters, high-resolution photos and an enhanced UI. Underwriting the update is a complete rewrite of the camera code, which has allowed the team behind the app to make filters 200 times faster than before. You’ll now be able to switch between them after you’ve taken a photo, in “no time at all”. You can see the camera’s new interface in action on Instagram’s website. The biggest and most important change is a dramatic increase in the size of the images that are captured. Previously, pictures came out at 612 x 612 pixels, but that’s now been increased to 1936 x 1936 on the iPhone 4 and 1536 x 1536 on the iPhone 3GS. Instagram says this this was “by far the most requested feature from pros and amateurs alike”. There are four new filters — Amaro, Rise, Hudson and Valencia — which have been produced by a community member called @colerise. Instagram teases the possibility of further community collaborations in the future. Depth-of-field has been made faster too. Selective blur works at over 100 times the speed it previously did, and you can pinch, pan and rotate the tilt-shift effect, along with a live preview of how the effect will look on your images. Finally there are various other tweaks, including the option to remove borders, one-click rotation within the camera and a new icon. 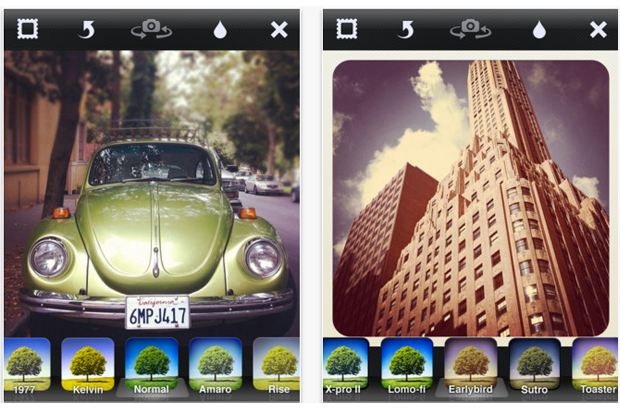 “It’s the same look, but with more depth and dimension,” says Instagram. You can download the update now from the App Store. It’s free, and only works on iOS v4.2.1 or above. Sorry Androiders, it’s Apple-only.